The Mediterranean countries have been developing a regional marine and coastal protected areas network with the active support of UNEP/MAP-SPA/RAC through the boosting of marine protected areas (MPAs) establishment and management. However, while present MPA coverage in the Mediterranean is estimated to 8.98 percent, the majority, 57 percent of it, belongs to the Pelagos Sanctuary, the Spanish Cetacean Corridor and GFCM fisheries restricted areas (FRAs). For the remaining part, almost 2/3 (64 percent) belong to the expansion of Natura 2000 marine sites in the EU waters. The growing relevance of the ecosystem approach and marine spatial planning (MSP) should translate into support to the existing MPA system in a harmonic coexistence with a long-term sustainable exploitation of marine live resources. Experts underline that one of the key objectives within any marine spatial planning should be to designate new MPAs in areas which require special protection (especially in the open sea) and consequently enlarge the network of the existing MPAs for it to be representative and functionally connected. MSP and ecosystem approach initiatives could in practice contribute to the achievement of Aichi target 11, specifically by dealing with pressures beyond their borders, and by providing political will for effective MPAs and other effective area-based conservation measures (OECMs). In the framework of the FAO-GFCM Forum on fisheries science, the Fish Forum, SPA/RAC organized a workshop on the complementarities between Marine Protected Areas (MPAs) and fisheries spatial measures for area-based management. This event aimed to facilitate exchange of approaches undertaken and synthesize common views on how to progress towards a sustainable marine spatial management of the Mediterranean. Spatial governance tools used in different countries of the Region, as well as by intergovernmental and other international regional bodies dealing with different activity sectors, become more powerful and efficient when combined together for a coordinated and harmonized sustainable use of marine resources and preservation of biodiversity through an spatial approach. It is worthy to highlight in the above context the implementation of SPA/RAC support to Parties to develop the Barcelona Convention regional collaboration tool for MPAs and other OECMs: the “Roadmap for a Comprehensive Coherent Network of Well-Managed MPAs to Achieve Aichi Target 11 in the Mediterranean” that supports the existing “Regional Working Programme for the Coastal and Marine Protected Areas in the Mediterranean Sea including the High Sea” . 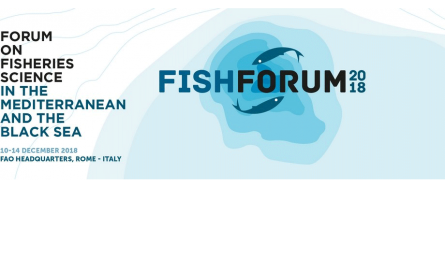 More information about the event are available on the Fish Forum website.